Access to patented seed for research and development has been very much in the news of late. Of course, it is not the patent necessarily rendering a product inaccessible for research, but the agreements licensing the seed. 27 representatives of the research community and industry met in Ames, Iowa, 30 June 2009, to consider the issues surrounding access to research in the seed industry. The meeting generated discussion on a set of principles to support public sector research on commercial, patented seed products. The final version of these principles will be presented to the major industry bodies for approval in September (going to the Biotechnology Industry Organization (BIO) 10 September, and to the American Seed Trade Association (ASTA) Executive Committee of the Board of Directors, 17 September). Their implementation by the industry will be of interest. Although agricultural biotechnology is a significant commercial and innovative bonus to the seed industry, its promise for food security in the developing world is less certain and more socio-political. Wilhelmina Quaye argues that agricultural biotechnology is a socio-cultural issue. 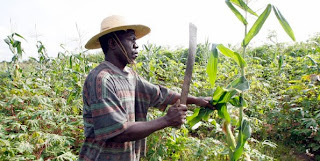 Writing in Business Daily, Quaye says in order to improve the use of biotechnology for food security and advancement in developing countries, the communities themselves must be involved in its implementation and development: "it must improve their capacity rather than create ties of dependency." Quaye also notes in Africa in particular the fear over losing traditional ways of farming: "The bottom line is that anyone developing biotechnologies must respond effectively to the intended users' needs and aspirations ... To do this, biotech agendas must consider the socio-cultural realities in Africa." In the United States, the real significance of traditional agricultural knowledge and practices is starting to be recognised. 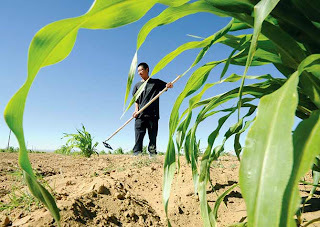 The US Department of Agriculture (USDA) recently released the 2007 Agricultural Census, which is the first to count all individual Native Amer ican farmers on reservations across the country. Native Americans in Arizona, for instance, have been found to operate more than half that State's farms and ranches. And the numbers are expected to be even higher. Despite efforts to publicise the Census widely, including meeting with tribal leaders to discuss the process, individuals were inevitably missed. Farms are generally smaller than the national average, but nearly the entirety of the Dine reservation is under cultivation or grazing. One Hopi farmer, Richard Kuwunvana (pictured at right), says, "Our family has farmed this land forever. We're part of the corn, and it's part of us." Following on from the story in "Seeded Players" (18 August 2009), Monsanto is again in the news over alleged anti-competitive behaviour. The New York Times reports today that DuPont and Monsanto are locked in a battle, with DuPont accusing Monsanto of anti-competitive practices, while Monsanto has retaliated saying DuPont has committed a "serious breach of business ethics." In a letter obtained by Reuters, Monsanto chief executive, Hugh Grant (pictured at right), requests DuPont chairman, Charles O. Holliday Jr. (pictured below left), to establish a special committee of DuPont's independent directors to investigate the matter. Meanwhile, Monsanto has released a statement in response to the increased negative press. The claims of corporate misconduct include allegations that DuPon t provided financial support to critics of Monsanto and forged documents. But DuPont has stood fast saying that Monsanto has conducted itself anti-competitively to the detriment of farmers and others. And in May this year, Monsanto sued DuPont for patent infringement; in June DuPont retaliated with a countersuit in antitrust: "This case involves a scheme by Monsanto to monopolize agricultural biotech traits in corn and soybeans, and emerging combinations of such traits." Trait-stacking is where more than one trait (such as herbicide and insect resistance) is transferred to a crop, and so more than one gene. Cross-breeding of GM plants can achieve this as well as genetic engineering. The litigation follows a breakdown in a licensing arrangement between the two companies. DuPont claims it was entitled to combine the traits from Optimum GAT (DuPont) and Roundup Ready (Monsanto) under the terms of its licence. However, Monsanto argues that this is infringement of its patent and that "DuPont’s unauthorized use of our technology and patents is simply unacceptable." However, the US Department of Justice Antitrust Division appears to have a different position. Indeed, investigations into several recent mergers in the industry have required significant divestitures, including that required of Monsanto and Delta & Pine Land, where a significant seed company and other assets had to be divested before the companies could proceed with their merger. The companies were also required to amend licensing agreements to respond to concerns with trait-stacking. Philip J Weiser, the Deputy Assistant Attorney-General, explains, "because DPL had had a license allowing it to "stack" a rival's trait with a Monsanto trait, Monsanto was also required to amend certain terms in its current trait license agreements with other cottonseed companies to allow them, without penalty, to stack non-Monsanto traits with Monsanto traits. As a result, producers of genetically modified traits gained greater ability to work with these seed companies." Notably, the US Department of Agriculture and the US Department of Justice has announced that they will investigate antitrust concerns in the seed industry through a series of public workshops in 2010. In an address to the Organization for Competitive Markets two weeks ago, Weiser said, "Over the last twenty years, changes in technology and the marketplace have revolutionized agriculture markets, producing some substantial efficiencies as well as concerns about concentration. Notably, farmers today increasingly turn to patented biotechnology ... At the same time, this technological revolution and accompanying market developments have facilitated the emergence of large firms that produce these products, along with challenges for new firms to enter the market." A lawyer for DuPont, Donald L Flexner, spoke to Reuters, "This is not just a DuPont problem. This is a competition problem. They've gained illegal monopoly power." Genetic modification is not infrequently referred to as the future for food security and agricultural sustainability in developing countries. This alone is perhaps a controversial statement and many would take issue - for instance, questions of environmental security and loss of agricultural biodiversity are just some of the major questions raised. But rather crucially, apart from debates over the nature of the technology, there must be access to that technology, not only for its immediate application but also for its ongoing development and improvement. This is a major issue raised in a recent editorial in Scientific American. Agritech companies like Monsanto and Syngenta are regularly requiring those purchasing their seed to contract out of any research or experimental use exemption that might be provided in patent law and other areas of intellectual property law. Such an exemption (often referred to as the experimental-use defence) allows for research on a patented invention in order to continue to the cycle of innovation. In other words, research conducted upon a patented invention is exempted from infringement. Indeed, this is perhaps one of the fundamental and historical premises of patent law - that is, to disclose an invention in order to acquire a monopoly. It may be argued by some that this is a legitimate exploitation of the monopoly, however such contractual restrictions may persist well beyond the life of a patent, thus compromising the supposed calculation of time needed to balance the costs of research and development and the public benefit of access to innovation. Thus, if such an agreement can override exceptions for research and become a genuine and explicit obstacle to independent research, then the notion of "user rights" sometimes applied to exceptions in patent law and other areas of intellectual property becomes somewhat problematic, if not specious. But what of the rights of purchasers of seed? Thus, it is not an issue with patent law per se, but an issue of contract law. If the exception is not to be compromised, the relevant legislation must preclude a contractual condition having effect. But this is an issue that is not necessarily addressed in the applicable legislation, not only in the US but also in the UK and elsewhere in Europe. 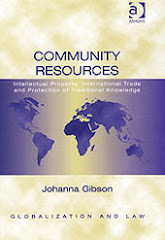 Similarly, many developing countries have introduced patent regimes that neglect this protection. Nevertheless, in Europe the rights of the user with respect to research conducted upon seeds may indeed be less ambiguous. For instance, in relation to plant variety rights, Switzerland has implemented recently a separate defence to prevent the practice of contracting out of the research exception (Article 8), restricted of course to plant variety aspects. Many have recommended that this sort of protection should be harmonised throughout Europe (and indeed internationally). According to Scientific American, the agreements deployed by Monsanto and others "have explicitly forbidden the use of the seeds for any independent research. 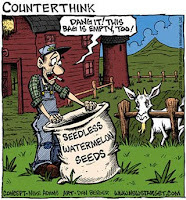 Under the threat of litigation, scientists cannot test a seed to explore the different conditions under which it thrives or fails ... And perhaps most important, they cannot examine whether the genetically modified crops lead to unintended environmental side effects." As the article explains, research is still published, but only that research approved by the company itself, completely disabling the intellectual freedom of scientific research and perhaps also the objectivity upon which scientific knowledge bases its import. Under the Access to Research for Development and Innovation (aRDi) scheme, Patent offices in developing countries will be given greater access to 150 online scientific journals by the end of the year. 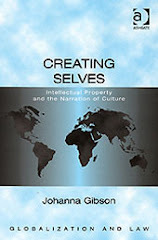 The scheme was launched in July by the World Intellectual Property Organisation (WIPO) in partnership with major scientific publishers, including Elsevier, Oxford University Press, Springer Science+Business Media, and Taylor & Francis, and linked to one of the key recommendations of the WIPO Development Agenda. Recommendation 8 of Cluster A (Technical Assistance and Capacity Building) of the 45 Adopted Recommendations under the WIPO Development Agenda, calls for WIPO "to develop agreements with research institutions and with private enterprises with a view to facilitating the national offices of developing countries, especially LDCs, as well as their regional and sub-regional intellectual property organizations to access specialized databases for the purposes of patent searches." According to the Science and Development Network, the scheme will facilitate the process of patent examination in developing countries, with 50 least-developed countries being provided with free subscriptions and 57 developing countries offered low-cost subscriptions. 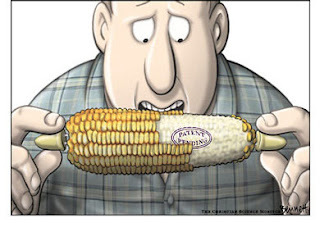 After last week´s sowing ban of MON 180, a genetically modified maize strain by the German Federal Minister of Agriculture, Ilse Aigner ("Patenting lives" reported), the patent holder Monsanto launched a legal action against this decision yesterday. A representative of Monsanto stated that the ban was contradictory and not in accordance with EU-rules. Hence, along with filing an action at the administrative court of Braunschweig, Monsanto is also seeking injunctive relief by the court. The haste in which these steps are taken is grounded on the fact that maize would need to be sown in May. According to Monasanto´s speaker the company is expecting a decision by the court by mid May. MON 180 is genetically modified strain of maize which includes a gene from the bacillus thuringiensis and produces a poison which repels the parasitic larvae of the European Corn borer, a butterfly. By declaring the sowing ban, Ms Aigner applied the Safeguard Clause by which the competent authority may suspend the permission to dispose genetically altered organisms if new or additional information becomes available which may lead to a new risk assessment. The Minister based her decision on new studies which apparently have provided reasonable evidence that the genetically modified strain of maize would present a hazard to the environment - specifically for butterflies, lady birds and creature od the water. Meanwhile, evidence is given that the German Federal Government has not yet reached a common consensus on its position on green genetical engineering. The Federal Minister of Education and Research, Annette Schavan, is critizising her colleague´s decision to mandate a sowing ban on MON 180. Ms. Schavan refers to green genetic engineering as one of the technologies of the future. Additionally she announced that fundings for such technologies will be expanded. The Minister has announced that she is scheduling a roundtable in Berlin for the 20th of May on genetical engineering. Hereby all stakeholders would be invited. This would include associations, companies, scientists, non-governmental organisations as well as churches. The outcome of this roundtable might shed some light on what direction green genetical engineering might be heading to in Germany. This will most certainly have an impact on the wider, namely the European scale. Last week has been a noteworthy one in Germany for biotechnological patents for agricultural applications and has received wide interest, nationally as well as internationally. 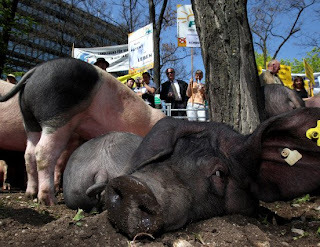 Hundreds of farmers, environmentalists and others gathered outside of Munich´s Erhardtstrasse 27, the principal seat of the European Patent Office (EPO) last Wednesday to protest against the so-called „Pig patent“ EP 1651777 B1 (above; 30 pigs "accompanied" the protests). The protesters used this opportunity to file a notice of opposition backed by more than 5000 individuals and more than 50 associations against the patent at the EPO which was granted on the 16th of July 2008 to Newsham Choice Genetics. The protesters criticized the practice of patenting biological processes since “they have nothing to do with inventions”, as Hubert Weiger, the head of the “Bund Naturschutz Bayern”, an environmental group in Bavaria, stated. The farmers were specifically concerned that the continuing patenting of life stock would seriously aggravate their work by being threatened to pay excessive royalty fees to patentees which usually are multinational corporations in this area. Initially the patent application contained 30 claims, from which some were related to animals as such, DNA sequences and the test kit. However the examination of the EPO has limited the claims to the screening method, whereas the claims to animals (pigs), the gene sequences and the test kit were rejected. The patent now solely relates to a “breeding method whereby a genetic analysis is carried out to screen for a variation (polymorphism) occurring naturally in some pigs, with a view to identifying those animals suitable for improving pork production and to selection appropriate breeding pairs” (see the press release of the EPO). The main motto of the protest however was: “Stoppt das Patent auf die arme Sau” which stands for “No patents on the poor pig” and hereby – deliberately or negligently - wishes to render the patent as granted to a patent on pigs as such and hence being misleading. This may be excused due to the fact that this slogan is in its German meaning quite catchy and therefore serves the purpose of the protests. The press release of the EPO however clearly highlights that no patent on animals or gene sequences has been granted. The claims as they were initially filed may have lead to the realisation of such fears as expressed by the protesters but the examiners at the EPO did their job well in applying the rules of the European Patent Convention (EPC). However, the protests and the hereby created public interest actually do highlight a major deficiency in the IP system and its public perception. 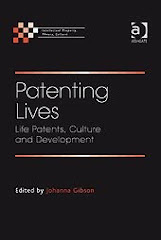 It has not been achieved to thoroughly inform society as a whole what IP, and specifically patents is all about, how it operates and where its limitations are. IP has lately had a bad press whereas its benefits are often overseen. This needs to be addressed, bearing in mind its possible negative effects as well as to further explore how these may be overcome. The press release by the EPO has highlighted in its last paragraph another rather more legal deficiency, which remains a hot topic and warrants determined action by policy makers. The EPO ceases to have jurisdiction totally 9 months after grant and the patent then falls within the jurisdiction of the nominated Member States. Post grant “quality control” by litigation on what should be patented is therefore seriously being hampered. In case of the “pig patent” (18 of the 35 Member States of the European Patent Organisation have been nominated for patent protection) this could mean multiple - and therefore expensive - litigation in all nominated jurisdictions. Earlier this week the German Federal Minister of Agriculture, Ilse Aigner, has proclaimed a ban on the use of the genetically modified maize strain MON 810, which has been patented by Monsanto. The Minister was not hesitant to state that the decision was not a political one but was solely based on the facts of the case. Therefore, the decision should not be regarded as a fundamental verdict on the use of genetically modified crops in Germany, as Ms. Aigner affirmed. However, the political pressure is constantly growing. The Minister of Environment of the Federal State of Bavaria, Marcus Söder, has expressed the wish to make Germany a „genecrop-free zone“ and has reaffirmed this goal in a speech at Wednesdays´ protests against the “pig patent”. He joins the Ministry of Environment of the Federal State of Hessen, which is about to launch a legislative initiative in the „Bundesrat“, the 2nd chamber of parliament in Germany which consists of representatives from the 16 federal governments, to ban the patenting of newly bred animals and plants. By doing this, the Ministry wishes to call upon the German Federal Government to lobby the European Council and the European Commission to tighten Directive 98/44/EC on the legal protection of biotechnological inventions. It now remains to be seen what impact the incidents of last week in Germany will have on the patenting of biotechnology. Mon 810 is currently banned in 6 countries of the European Union, including Germany. And it appears that the European Commission is willing to reconsider certain issues on patenting biotechnology. Scientists in India have launched Agropedia, an "agricultural Wikipedia." The project was first devised around 3 years ago by project lead, T V Prabhakar. Prabhakar, of the Indian Institute of Technology in Kanpur, saw a need for the equivalent of Wikipedia to be created for global agriculture. The project was revised to focus on information specific to India. The 85 million rupee project will be implemented over 30 months to provide on-line access to agricultural information and knowledge throughout the country. Funded by the Indian government (the National Agriculture Innovation Project (NAIP)) and World Bank, resources will include information on crops and practices, regional knowledge and relevant research. Its primary objective is to provide an effective dissemination mechanism not only for researchers and students, but also farmers and agricultural extension workers. The website launched with information on 9 crops - rice, wheat, sugarcane, lychee, groundnut, sorghum, chickpea, vegetable pea and pigeon pea - but the objective is to expand the resource so as to include all information related to agriculture and agricultural practice. 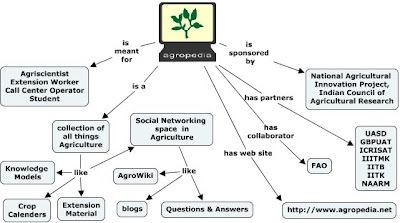 In true wiki-style, Agropedia is a dynamic resource to which content is constantly added and reviewed. Agricultural researchers are invited to validate information through the "open source" wiki model, but additional review will no doubt emerge through user feedback and contributions. Blogs and user forum facilities enhance and broaden the kind of knowledge provided and exchanged through the project. The 7 consortium partners in the project include the International Crop Research Institute for the Semi-Arid Tropics (ICRISAT); Indian Institute of Technology, Kanpur (IITK); Indian Institute of Technology, Bombay (IITB); G B Pant University of Agriculture and Technology (GBPUAT); Indian Institute of Information Technology and Management, Kerala (IIITM-K); National Academy of Agricultural Research Management (NAARM); and the University of Agricultural Sciences, Dharwad (UASD). The first stage of the project involved refining the mechanism to manage the knowledge, with the next phase to concentrate on dissemination, with trials to commence in 6 locations around the country. Dissemination is not a straightforward exercise. While access to the necessary communication technology may be difficult for some, the resource will nevertheless improve the infrastructure to deliver information to all farmers. With the cooperation of agricultural extension workers and the establishment of around 12000 information technology-enabled rural information centres, the introduction of Agropedia should improve the accessibility of agricultural information whether directly or through farming networks. Innovative approaches to innovation are therefore very important. For example, V Balaji, head of knowledgment management and sharing at ICRISAT, has suggested that Agropedia resources might be used in various ways to disseminate information, including radio plays. As one of the agricultural centres of the world and in a region rich with traditional agricultural practices and knowledge, India possesses unique resources for its ongoing development. This kind of enterprise has the potential to provide a significant facility for detailing and sustaining that development.